Michael Alex Hunter’s joyful personality offers no hint of the battles he has fought and won. 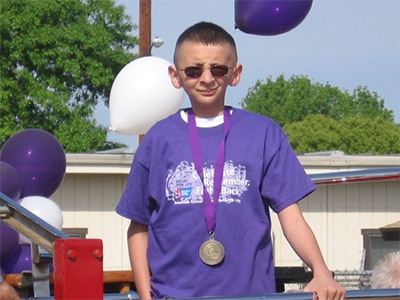 With the help of the medical team at Valley Children’s Hospital, the Delano teenager has beaten two different cancers. While the illnesses and treatments have taken their toll, Alex – as he prefers to be called – is a bolt of sunshine with a passion for helping others. In June, Alex graduated from Cesar E. Chavez High School, where he had been recognized for his kindness. The 18-year-old filled his senior year with traditional studies and also sang in the choir – performing solos in the Christmas and spring concert programs – and attended prom. He is now enrolled at California State University, Bakersfield, where he plans to live on campus in the fall and major in psychology. It is a future that might not have seemed possible without years of diligent care and treatment at Central California’s only provider of comprehensive inpatient and outpatient pediatric cancer and blood diseases services. Valley Children’s offers access to the state-of-the-art care partly through a relationship with the Children’s Oncology Group (COG), the world’s premier organization devoted to childhood and adolescent cancer research. Nationally, Valley Children’s ranks in the top 4 percent in enrolling patients in COG’s therapeutic studies. Lizbeth Hunter, Alex’s mother, said the Valley Children’s team has been consistently caring and supportive through many tough times. 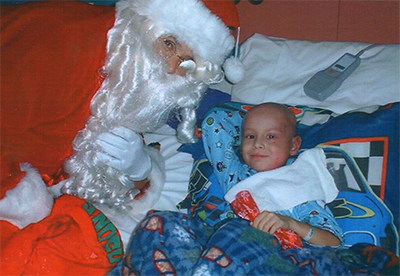 The Hunter family began building a relationship with Valley Children’s in late 2002, just after 4-year-old Alex was diagnosed with rhabodomyosarcoma – a malignant tumor in his face. Back then, earaches were a continuing problem for the little boy. The tumor was creating pain as it pressed against his ear canal. Eventually, the family went to a specialist who found a golf ball-sized mass in Alex’s left cheek. “When your child is 4 and you’re completely new to the cancer world, that’s not what you want to hear,” she said. Looking for other alternatives, the family discovered that Valley Children’s could provide the cancer-killing chemotherapy and radiation treatments that Alex needed. Valley Children’s also was closer – a 90-minute drive from the Hunters’ home – and the commute didn’t require a trip over the Grapevine. The Hunters felt at home at Valley Children’s very quickly. Lizbeth said pediatric hematologists/oncologists such as Dr. Vonda Crouse “were heaven-sent for us,” and that nurses, social workers and others also were instrumental in helping the family. At first, the intense treatments required Alex to remain in the Hospital for several months – and many family members pitched in then and throughout his therapy. Lizbeth, who was pregnant when Alex was diagnosed, sometimes had to limit contact due to his radiation treatments. Diego, the second son born to her and her husband Michael, is now 13. After a few months, Alex went home but frequently returned for additional treatments related to his cancer. He continued to have regular checkups at the Valley Children’s Cancer and Blood Diseases Center after completing chemotherapy in July 2003. Valley Children’s monitors children following treatment. Our Childhood Cancer Survivorship Program works with cancer-free patients who are at least three years beyond their last treatment. The program is one of few in California and is especially important because roughly 80 percent of children survive cancer for at least five years. More than two-thirds of survivors will experience long-term side effects. At Valley Children’s, the survivorship program provides education, screening, extensive treatment histories and more for patients as they transition into adulthood. In Alex’s case, doctors knew he was at-risk for side effects particularly from radiation. 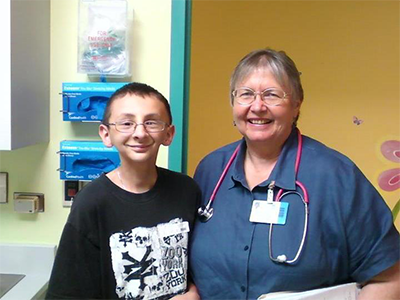 During one checkup in oncology, doctors noticed Alex’s small size and referred him to endocrinology – one of numerous pediatric subspecialties available at Valley Children’s. A poorly functioning thyroid – the gland that helps regulate the metabolism and growth functions – meant that Alex was not growing properly. He began taking medication and hormones to encourage growth. In 2011, doctors diagnosed Alex with a rare form of cancer known as Hurthle cell carcinoma. Radiation treatments to the neck and head are risk factors for developing that cancer in the thyroid. Ultimately, doctors removed Alex’s entire thyroid gland. Dr. Nedim Cakan, Valley Children’s medical director, pediatric endocrinology and diabetes, has been seeing him since 2012. He said Alex is cancer-free and faithfully following all medical instructions. Alex continues to be screened for any recurrence of cancer. He and Dr. Cakan have a candid and warm relationship. “He’s always fun to see,” Dr. Cakan said. Alex may still face more battles. Last year, he decided to have his teeth removed because of irreparable damage caused by radiation treatments. A GoFundMe campaign raised the cash needed for dentures and to pay for future medical bills. In keeping with his desire to help others, Alex said he has volunteered to become a mentor to children at the Hospital. As a boy, he often thought of Valley Children’s as his castle. “The doctors are nice and it’s a good hospital – probably because they understand my kind of cancer,” Alex said.